Or Click Here to download voucher! The friendly team at Vitaphysical offers a range of osteopathy and massage treatments to patients in the Murton area, helping to cure your body’s aches and pains. Whether you are in the process of recovering from an accident or you’re planning your first big sporting endeavour, we can help. Our massage therapists work alongside Vitaphysical’s osteopath, Jason, providing solutions for all types of conditions including back pain, headaches and sore knees and hips. 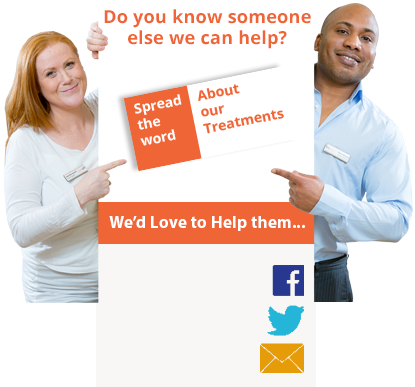 You’ll find a list of the complaints we address through our treatment on our what we treat page, though we’re always happy to discuss your unique set of circumstances during a free telephone consultation. Our massage therapy offering is particularly extensive and includes full body massage, deep tissue massage and relaxation message. We also offer sports therapy, addressing strength and stability and work with mums to be to ease discomfort and pain with our pregnancy massages. A number of emergency appointments are available each day, so when pain strikes we can usually see you the same day or at least within 24 hours. This is just part of our commitment to our patients; we’re very proud of the work that we do and are pleased to be able to share some patient success stories here with you. Most of our patients come to us as a result of recommendations from friends or family members who have previously attented the Vita Physcial clinic themselves. Some clients have already undergone courses of treatment elsewhere – either physio through the NHS or perhaps visiting a private chiropractor. We find they incredibly relieved to discover a successful solution to treat their conditions. The modern Vitaphysical centre is located in Sunderland on John Street, so there’s no need to travel for hours in order to see a specialist. We offer free patient parking on site too. To book an appointment with Vitaphysical please call 0191 565 886 or email info@vitaphysical.co.uk, you can also use our online booking system. Don’t forget to download your discount vouchers, which are redeemable against your first visit to us. We look forward to welcoming you for massage or osteopathy treatment at Vitaphysical soon; we’re less than ten miles away from Murton, County Durham.